An interdisciplinary team of faculty, staff and students has added helpful accessibility features to the campus map. Navigating the 5,200-acre Texas A&M University campus just got a little simpler for Aggies with disabilities, thanks to recent improvements made to the Texas A&M Aggie Map. 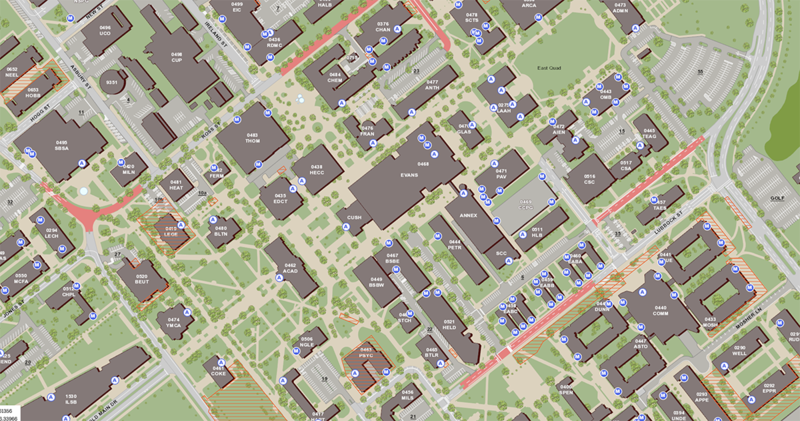 Students, faculty and staff on an interdisciplinary development GIS Team successfully designed new features for the map, which now includes campus navigation via walking and biking — for visitors, students, faculty and staff of all abilities. Texas A&M’s Aggie Map has been enhanced to offer routing services to/from anywhere to anywhere on and off campus, with a brand new mobile interface designed for modern phones. Those who use mobility devices can use the interface to find routes that easily guide them to accessible entrances via accessible routes on the Aggie Map, avoiding obstacles such as curbs and stairs. Texas A&M is committed to maintaining an accessible campus community and complying with the Americans with Disabilities Act (ADA), and now the official map of campus also reflects the important features that make Aggieland accessible to all. For their work on the Aggie Map accessibility project, the GIS Team received a 2018 Excellence Outstanding Team Award from the Texas A&M Division of Finance and Operations. The award is generously funded by The Association of Former Students. A screenshot of the Aggie Map, with the accessible entrances layer visible. Andrew Fleming and Min-Hung ‘Hank’ Chou, both GIST undergraduate students. And earlier this year, the ESRI Development Center at Texas A&M awarded their Student of the Year Award to Fleming, for his student leadership and work on the project. “Andrew worked hard to complete this student research, service learning project and created important new accessibility functionality within the Aggie Map that will benefit students, staff and faculty throughout campus,” said Goldberg. 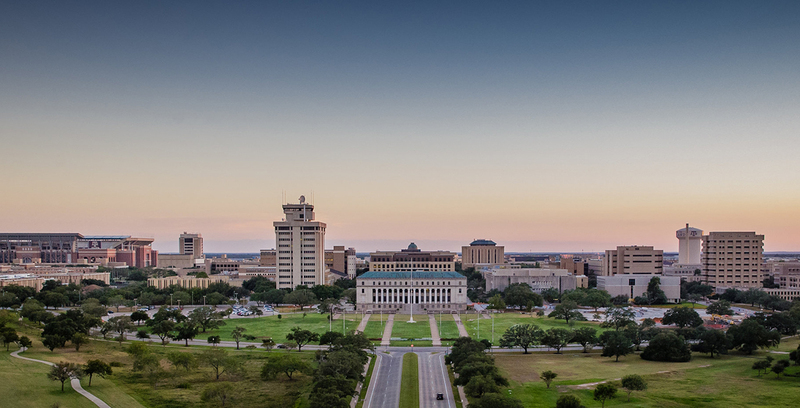 A grant from the Texas A&M Office for Diversity and support from the Department of Geography, College of Geosciences funded the accessibility mapping project. In addition to the above Aggie Map partners, this project included the TAMU Department of Computer Science and Engineering, and TAMU Libraries’ Maps and GIS Services. During the spring semester, Fleming attended the ESRI Developer Summit, with Texas A&M faculty and staff, and received guidance on building and completing the ADA mapping project directly from industry leaders looking to push the boundaries of accessible navigation, Goldberg said. Fleming interned with ConocoPhillips last summer, will intern there again this summer, and plans to graduate in December 2018, he said. Originally from Virginia, Fleming plans to use his GIS degree to continue solving real-world problems after graduation. Disability Services partners with Facilities Services, Residence Life, and Transportation Services to facilitate access to buildings, residence halls, parking lots and other locations on campus. Students with disabilities who experience physical barriers should contact Disability Services for assistance.